This title was first published in 2001: Based on extensive research, this trilogy provides new insights into Post-Soviet transformations without taking refuge in the traditional assumption that Russia is unique. Using powerful analytical tools, this trilogy marks the re-integration of the Former Soviet Union (FSU) into the main current of political science. An invaluable resource for all those interested in Russia and the Post-Soviet states. This first volume focuses on state, sectoral, and transnational actors from a predominantly rational choice perspective. 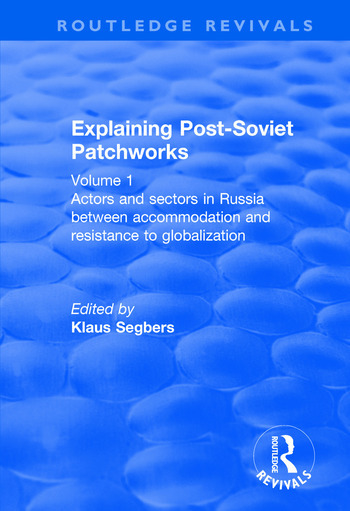 The book includes an extensive introduction by the editor which uses additional material gathered by the project team on two polls, 1999 and 2000, which, in addition to the individual studies, provide sufficient data to obtain unprecedented insights into the basic preferences and the logic of action of the main players in Russia. The outcomes of this research will be particularly relevant for students, researchers, journalists and decision-makers interested in Russia and the Post-Soviet states’ politics, international relations, economics, social policy and sociology. Contents: Actors and interests in a changing Russia, Klaus Segbers; International financial organizations and globalization by default, Ognian Hishow; The origins and management of the federal debt to the world, Artos G. Sarkisiants; Financial supervision and moral hazard on an emerging market, Irina N. Iudina; Large corporations as national and global players: the case of Gazprom, Andreas Heinrich; Large corporations as national and global players: the case of Lukoil, Sergei P. Peregudov; The mining and metal industry and globalization, Stephen Fortescue; The banking sector and its international involvement, Artos G. Sarkisiants; Financial groups and the development of market institutions, Grigorii V. Krasnov; The mass media between political instrumentalization, economic concentration and global assimilation, Ivan I. Zasurskii; The telecommunications sector: signs of liberalization and globalization, Elena K. Rytsareva; High-technology defense production: the move into foreign markets, Ruslan N. Pukhov; Defense industry managers and the dynamics of intra-sectoral divergence, Leonid I. Kosals and Rozalina V. Ryvkina; Actors in agro-food policy: who shapes outcomes?, Evgeniia V. Serova; Agrarian actors in the localities, Zemfira I. Kalugina; Industrial managers’ aspirations towards foreign markets: motives, methods and the consequences for companies, Igor B. Gurkov; Small business in the context of international integration, Tat’aina A. Alimova; The self-denying middle-class in a global age, Harley D. Balzer; Bibliography; Index.